The Mobility Scooter Shelter has been specifically designed for the external storage of mobility scooters. Mobility Scooter Shelters are custom made to individuals requirements. With a choice of roof cover, cladding and features, each shelter is taylor made to your needs. Gates to front of shelter can be sliding or hinged and automated, if required. Please call our sales department now with your requirements. Mobility scooter shelters from Apex Shelters are the only method of storing your mobility scooter, whether for residential or for business use, providing protection for your scooter from the elements as well as a safe place for it to be stored when not being used. With these scooters being such expensive pieces of equipment that are essential for getting around, it’s important to invest in proper shelters, and our high quality mobility scooter shelters are the best around. Useful for keeping your scooter warm and dry, away from weather that may damage it, one of our shelters can be a brilliant addition for either personal or commercial use. This includes outside of facilities which many elderly or disabled people may use, or just in the home for extra protection when not actively using the scooter. Why should you buy your mobility scooter shelters from Apex Shelters? Well, our products are so easy to use, assemble and maintain that you won’t have to worry about dealing with any fiddly parts or instructions when setting up one of our shelters. Despite the ease at this first stage, however, that doesn’t mean our mobility scooter shelters aren’t high quality, with durable, robust parts that make sure your shelter is strong and long lasting. They’re also state of the art, with fob entry on gates included and charging points that can be incorporated – not only storing your scooter, but keeping it charged as well. We understand that a mobility scooter often offers someone their only means to get out and about, and that is why we are committed to providing the absolute best mobility scooter shelters on the market. Our shelters are specifically made for storing scooters externally, and can be custom-made to any size. This flexibility is a big part of our service, and means that any business or residential area can include one of our mobility scooter shelters no matter how much space they have. Where Can You Find the Best Mobility Scooter Shelters? Depending on how many scooters you’re going to be storing, our shelters are modular, allowing you to link them together for the perfect amount of space. You can also bolt our mobility scooter shelters to concrete or get one of our shelters with extended legs to submerge into the ground. This makes sure our shelters are sturdy and strong, able to protect mobility scooters from wear and tear as well as thefts or vandalism. 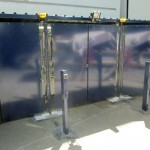 To complement the safety features of mobility scooter shelters, our products also have lockable doors as standard, manufactured with sliding gates for ease of access. The safety and protection offered by our shelters is unbeatable, and Apex Shelters offer a huge range of products used to protect everything from motorcycles to scooters, and our mobility scooter shelters are the best choice for businesses that want to allow their visitors to store away their scooters in a safe and secure way. Contact us today find out more about our mobility scooter shelters. Mobility Scooter Shelters have been designed for ease of installation and are supplied in flat-pack form with full technical installation instructions. Alternatively, a full nationwide installation service is available including ground-works. Please contact the sales office for further information. Don't want to install yourself? Ask about our fast installation service! 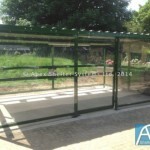 Apex Shelter Systems Ltd manufacture a wide range of quality shelters and associated street furniture at affordable prices. Shelters are designed to meet the structural integrity standard BS 5950-1990 (Structural use of Steelwork in Building Part 1). Apex Shelter Systems Ltd are CHAS and Constructinline approved.